Obey this pillow and sink into comfort. Pairs perfectly with its sister pillow, 'stay.' 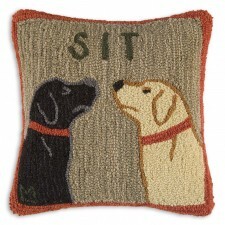 Hand hooked using 100% New Zealand wool and backed in velvet, this pillow is durable, comfortable and clever too! Dimensions are 18" square. Pillow insert included. Designed by Laura Megroz for Chandler 4 Corners of Vermont.